New York Republican Congressman Christopher Lee has resigned from Congress following revelations that he emailed a shirtless photograph of himself to a woman seeking a relationship on Craigslist. A clerk read Lee's resignation letter on the House floor late Wednesday afternoon. The married Congressman said he had "made profound mistakes" and was seeking forgiveness from "my family, my staff and my constituents." "It has been a tremendous honor to serve the people of Western New York," he said in a statement also posted to his website. "I regret the harm that my actions have caused my family, my staff and my constituents. I deeply and sincerely apologize to them all. I have made profound mistakes and I promise to work as hard as I can to seek their forgiveness." "The challenges we face in Western New York and across the country are too serious for me to allow this distraction to continue, and so I am announcing that I have resigned my seat in Congress effective immediately," Lee continued. Gawker reported Wednesday that Lee responded to an ad from a 34-year-old woman posted in the "Women for Men" section of Craigslist in January. The woman said she was seeking "financially & emotionally secure" men who don't "look like toads." Lee apparently responded to the ad claiming to be a divorced, 39-year-old lobbyist who described himself as a "fit fun classy guy." 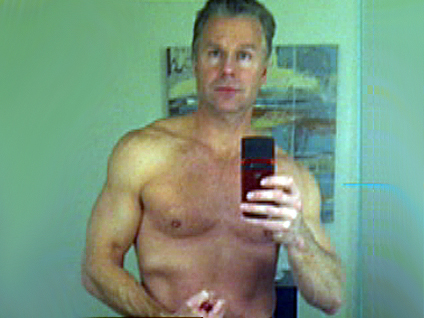 He sent the woman a two photographs of himself, including one in which he is shirtless and flexing. When the woman discovered that Lee is actually married, 46 years old and a member of Congress, she sent the correspondence and pictures to Gawker. Lee's office deflected media inquiries all day until his resignation statement was released, and Lee would only tell Fox News while walking to his car Wednesday afternoon that "I have to work this out with my wife." Gawker reported that his office first claimed in response to their questions that Lee's email had been hacked, and that Lee deleted his Facebook account following the site's initial inquiry. The previously little-known congressman, who has one child, is reportedly flying back to his home in Amherst, New York this evening. Lee is in his second term in Congress and represents a district in suburban Buffalo. He sits on the House Financial Services Committee, has a sales and manufacturing background, and has shown a willingness to work with Democrats. The race to replace him could be competitive: Sen. John McCain won the district by a narrow margin in 2008, 52 percent to 48 percent. Lee was one of eight members of Congress investigated by the Office of Congressional Ethics last year for improperly changing their votes on the financial reform bill in exchange for campaign contributions. He was eventually cleared.